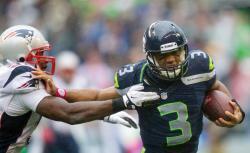 Russell Wilson 2012: The Seahawks rookie has great character. Is he a great quarterback? Russell Wilson has great character. Is he a great quarterback? Russell Wilson of the Seattle Seahawks rushes the ball against the New England Patriots. Photo by Stephen Brashear/Getty Images. The message: Beware, all ye who attempt to forecast a rookie’s career path based on a handful of games. Given the assignment by Slate readers (as part of our Reader Takeover) to write about Russell Wilson, I won’t embarrass myself by trying to divine the measurements of the Seattle rookie’s future trophy case. Yes, the Seahawks are 4-2 (albeit with a Space-Needle-sized asterisk), and Wilson played his best game yet in pulling out a come-from-behind, one-point victory against the mighty Patriots. And yes, as we’ve read in laudatory profiles and seen in TV spots, the rookie is smart, studious, humble, and looks fantastic in denim. But the smartest player isn’t always the best one—Ryan “that guy with the beard who went to Harvard” Fitzpatrick would be a lot more valuable if close games were decided by quarterback-on-quarterback Boggle. Irrespective of his work ethic and his height, Wilson’s college numbers suggest he deserved a shot in the NFL. As a senior at Wisconsin, he led the NCAA in passing efficiency, throwing 33 touchdown passes and just four interceptions. If he stood six-foot-five, Wilson would have been picked in the first round. Instead, he fell to Seattle in the third, a position that reflects Wilson’s position at the midpoint between the bias and generalization that keeps talented, atypical quarterbacks from getting an opportunity and the magical thinking about work ethic and winning attitudes that led the Denver Broncos to talk themselves into Tebow. Wilson, who beat out free agent signee Matt Flynn by posting a 110.3 passer rating in the preseason, will get the chance to succeed that many others never do. Boise State’s adorably tiny, hyper-efficient Kellen Moore, one of the best college quarterbacks ever, went undrafted this year. (He’s now the third-stringer for the Detroit Lions.) And in 2006, Ohio State senior Troy Smith won the Heisman Trophy, throwing 30 touchdowns and six interceptions. The six-foot, supposedly character-deficient Smith—he was suspended in college for taking money from a booster, which counts as a character issue in a world that reckons Mel Kiper a moral authority—wasn’t taken until the fifth round of the NFL Draft, and he’s accrued only 145 pass attempts as a pro. He was last seen as the quarterback for the UFL’s Omaha Nighthawks, where he battled for playing time with Eric Crouch and Jeremiah Masoli. Seahawk fans … haven’t seen a three-game win streak in three seasons. Then again, they have not seen a Seahawk quarterback like Rick Mirer in 18 years. Charger cornerback Donald Frank has seen somebody like him. Five games into his rookie season, Mirer indeed is a difference-maker, not just a snap-taker. The analogy to the eminent San Francisco quarterback is as flattering as it is premature, yet it is not too soon to say Mirer is on the verge of one of the great rookie-quarterback seasons in NFL history. Nineteen years later, Seahawks fans are hoping they’re not seeing another quarterback like Rick Mirer. The 6-foot-3 Notre Dame star, who was drafted second overall in 1993—and who did not go on to have one of the great rookie-quarterback seasons in history—was the Jake Locker of his day: a guy with a bad college completion percentage and an “NFL body.” The only thing that Mirer and Russell Wilson have in common is that they were both touted for their leadership skills. In the NFL, Mirer led his teams to oblivion, compiling a 24-44 overall record because of an errant arm. By all appearances, Wilson is not that kind of quarterback. The difference between untested rookie Rick Mirer and untested rookie Russell Wilson suggests that the NFL has been doing its homework, too.